The HTC Sensation is one of the hottest phones scheduled to grace the mobile scene in the coming months, but now it has moved one step closer to its actual release in some parts of the world, as Vodafone already accepts pre-orders for it. The carrier offers it for free if you pick a data plan that costs $58 (£35) or more per month. The aimed shipping date is stated as May 19. As we told you, Voda will enjoy a month-long exclusive period with this handset, but once it is over, Orange, T-Mobile and Three will join Vodafone in offering this sensationally powerful phone in the UK. 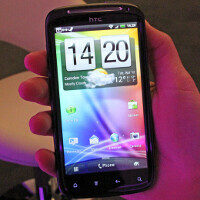 The HTC Sensation 4G, which is the US version of this beast, will be available for T-Mo customers "this summer" - the exact launch date is still unannounced, but the rumor mill claims it will be released on June 8.
what's the expected price in india..?